Prince Albert, the Karro town at the western side of the Swartberg Mountains, was founded in 1762, on the farm Queekvalleij. Originally named Albertsberg, its name was changed in 1845 to Prince Albert. The quaint town has 13 National monuments of Boer and English origin. Prince Albert is separated from the coast by the Swartberg Mountains, but connected by Meirings Poort Pass and the 19th Century, gravel, Swartberg Pass. 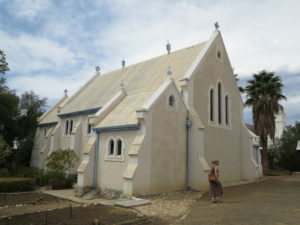 The album has images of some of the feature buildings in the town, the old English Cemetery and the Boer Cemetery. The Boer cemetery has famous names like Jan Haak, and Van Den Hoven, early settlers in the town. The English cemetery has the grave of Johanna Wilhelmina Herbert (nee Bland), who was the daughter of my Great Great Grandfather, Josiah Benjamin Adam Bland who came our to SA in 1825 and settled in Wyers Rivier and Mossel Bay. He had married Cecelia Frederika Du Plessis, whose ascendants, French Hugenots arrived in 1680. This album also has the Le Grange cemetery graves at the foot of the Swartberg on Angeliersbosch Farm.